Our recommended continuous-duty oil-free rocking piston air compressors are the highest performing piston compressors available. They are the perfect choice for aerating small ponds, sending air to mixing diffusers or dock bubblers or deep lake applications. Each pump comes equipped with noise re.. Complete aeration systems, available in two sizes, for aerating small ponds. Complete kits come with air compressor, 50' of weighted hose and a membrane air diffuser aseembly with check-valve. Weatherproof housing for compressors are available as an option. - The 1/20 HP kit is used for pond.. Complete aeration systems, available in two sizes for aerating small ponds from 3,000 gallons up to 16,000 gallons, These aeration systems come fully-equipped with a linear diaphragm compressor, weighted airline and super-efficient micro-bubble diffusers. Available in two sizes. Please note .. Complete aeration systems, available in two sizes for aerating large ponds, come fully-equipped with either a continuous-duty 1/4 HP or 1/2 HP rocking-piston compressor housed in a lockable, ventilated steel cabinet. The system includes one or two super-efficient micro-bubble diffusers on weighte..
Sentinel® Commercial aeration systems are for large lakes and ponds where multiple aeration stations are required to provide adequate circulation and mixing in large bodies of water. Sentinel® Commercial are availablle with either rotary vane air compressors or rocking-piston air compressors..
1/4 HP Rotary Vane Compressor PR-RV321 MAX 10PSI 4.0 CFM @ 5 PSI • 3.6 CFM @ 10 PSI 5.0 Running Amps - 110/115 volts. Includes: power cord, air-filter, thermal protection & inlet check valve 3/4 HP Rotary Vane Compressor PR-RV71 MAX 15 PSI 7.2 CFM @ 5 PSI • 6.8 CFM @ 1..
High output continuous-duty oil-free rocking piston air compressors by Aquatic Systems are an industry standard in clean air for pond and lake aeration. These compressors are replacements for the Vertex Aeration Systems or can be used as stand-alone air pumps if your application is appropriate. 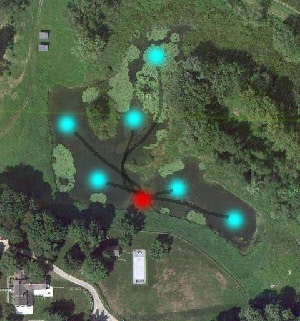 I..
Aerates ponds from 1/4 acre up to 1 acre in size with a maximum diffuser placement of 10' deep! This unit also comes with a lot of accessories for the price. The compressor should be kept in some sort of housing to keep it out of the rain and snow, build a simple doghouse style struct..
Small aeration systems for backyard ponds, fish ponds, goldfish ponds and koi ponds in the USA. Also ideal for hauling tanks or wherever circulation and aeration is required. Two sizes available, small and large. These all-inclusive aeration systems include 12" tube-style EPDM diffusers, qui.. This one really circulates your pond or lake! We've searched far and wide to come up with a rubber membrane diffuser that can generate a ton of air! What's even better is that this is a low psi design, which means your windmill or electric aerator doesn't have to struggle to open up the perfo..
Rotary Vane air compressors and vacuum pumps are used in thousands of applications worldwide. Available in oilless, lubricated, motor-mounted, and separate drive styles, they offer a wide choice of capabilities. Stratus® Rotary Vane Compressors Long lasting, continuous duty compressor..
Stratus™ line of rocking piston air compressors, each one designed specifically for the demanding job of 24 hour operation. They are ideal for pond aeration systems. The oil-less design safely aerates ponds with no electricity in the water. The shore mounted compressor sends air through tubing to.. This synergistic diffuser assemby has some of the smallest and finest bubbles available in any diffuser means that you get the most lifting of water column towards the surface and less pressure loss during operation. These diffuser assemblies require less PSI and so are perfect for linear air pum..
Aerates ponds up to 30’ in depth and 1 acre in size. Unit produces 3.5 CFM at 12’ of depth. Great for when you need an energy efficient way to aerate your pond 24 hours a day. Ventilated steel cabinet can easily post mounted. 3.5 amp draw makes this aerator very affordable. 1 year warranty. ..
Great for ponds up to 2 1/2 acres, this system includes the following: 1/2 hp Rocking Piston Compressor producing 5.0 CFM of air at up to 50 psi 220 CFM Circulating Fans to keep your Compressor cool A 3 Valve Manifold with 3 Adjustable Valves 300' of 3/8" Weighted Airlin..
Gast® 1/8-hp diaphragm compressor is completely oilless and built for continuous operation. Ideal for deeper applications, it will pump to a maximum depth of 35'. Air output max is 1.1 CFM. It requires no scheduled maintenance (except for cleaning the air filter) and is equipped with th.. Instead of airstones these diffusers use a flexible membrane EPDM membrane to resist clogging and fouling. These are the recommended diffuser in ponds or lakes that have a high level of organics or nutrients. Includes check valve to prevent water from filling air line when not in use. Polyet.. These cabinet-mounted 1/4 HP and 1/2 HP rocking piston air-compressors are ideal for aeration and dock bubblers. Each ystem comes with cabinet,two outlet manifold valves, air filter and ventilation fan. Airline and diffusers are optional or use whatever suits your application. Stratus™ line ..
Medo® USA Linear Piston Air Compressors These are not linear "diaphragm," but true linear "piston" type pumps. Since the only moving part—the piston—floats on a bed of air, a exceptionally long service life can be expected (8 years of continuous life is not uncommon). You will experience exce.. Linear II Diaphragm Air Pumps With higher output and lower watts—our best linear air pumps. SweetWater® Linear II air pumps average about 40% more air and about 20% lower power consumption. You will see similar looking linear air pumps imported from Asia, but the Sweetwater® brand is si.. If you need a small, quiet source of vacuum or pressure, you'll find this Gast miniature pump makes them especially compact and lightweight...ideal for light-duty applications. Shell made of sturdy plastic. Weighs 5 pounds. Small, continuous duty diaphragm compressor is surprisingly power..
Aerates ponds up to 8’ in depth and 1⁄2 acre in size. Unit produces 1.5 CFM at 8’ of depth. Great for when you need an energy efficient way to aerate your pond 24 hours a day. UL approved for outdoor use. 0.5 amp draw makes this aerator very affordable. 2 year warranty. Aeration Package..
PondLyfe™ aerators from Vertex address the growing need for a professional quality aeration system at an affordable price for water gardens and smaller ponds up to 1.5 acres in size. PondLyfe aerators benefit small pond owners who want the best available technology to restore their ponds to a cle..
Stratus KLC® Linear Diaphragm Air Compressors These linear diaphragm compressors are very durable and the continuous duty motors are designed for years of service. Ideal for aerating ponds, water features, bait and holding tanks and large aquariums. 115 volt motors are super q..
Diffuser Airstone is the secret ingredient for efficient aeration! These 7" Stones are manufactured with a large base to ensure the stone is sealed to the base correctly, forcing air out of the micro-pores in the stone. If holes are too big, you will get big bubbles. If they are too small, you .. This synergistic diffuser assemby has extreme pumping ability and comes with a weighted base for easy installation in pond aeration. Efficient multi-airstone diffusers with the finest micro-bubbles available small ponds and koi ponds. These diffuser assemblies are perfect for linear air pumps and..
Low oxygen levels result in costly and devastating fish kills. These High Oxygen Transfer Surface Aerator offers the most reliable, energy efficient and cost-saving aeration solution to prevent these catastrophic losses. Our aerators are specially designed for portability and ease of installation.. In our continuing efforts to take our products to new levels, we have expanded our Olympus Series Fountains to include .33-, .75-, 1-, and 1.5-hp units. The .33- and .75-hp are available in 115V, and both the 1- and 1.5-hp units are available in 230V. The new .33-, .75-, 1-, and 1.5-hp fountains ..
9" diffuser disc. Normal airflow range is 0–5 cfm. Equipped with 3/4" MNPT. Single disc or multiple discs can be used with linear air pumps, piston pumps, rotary vane pumps or regenerative blowers. Ideal for everything from small ponds to large lakes. Contact us with questions.12" Diffuser Discs ..
Versatile EPDM rubber membrane air diffusers can be fitted to a number of custom aeration and mixing situations. Much easier to clean than traditional silicate airstones these rubber tubes have surgical perforations for extremely small bubbles and are less prone to breakage compared to formed sol.. These 12V workhorses have proven to be the most reliable pumps we've reviewed. These are ideal for mobile use, temporary battery-powered aeration in remote locations, emergency aeration during power failures or as the solar powered pump to ensure there are no fish losses. They are oilless wi..
Fine bubbles when performance is demanded. With their round grain pore structure, low resistance to airflow, uniform porosity and resistance to clogging, these airstone diffusers are perfect for general aquaculture aeration and pond and lake aeration. These diffusers are engineered to produce ext.. Solid and adjustable ball valves allow you to control the airflow and pressure into two or three airlines. The airline from your air pump or compressor can be split to allow more than one diffuser to operate. The deeper diffuser will require more airflow than the shallow diffusers so these contro..
Aeration Cooling Fan 290CFM air flow rating. This fan will adapt to almost every aeration cabinet on the market today. Keeps compressor cool Increases motor life. Note that while these fans will fit almost all aeration cabinets these cooling fans were designed to fit in the cab..
Piston repair kits for the single rocking piston and dual rocking piston air compressors. To prolong the life of your piston compressor it is best to clean your ail filters every 3 months and to maintain the pistons and cylinders. The piston repair/refurbish kit includes piston valves and pi..
Regerative blowers are well-known as an energy-efficient and quiet way to provide oil-free air at high volumes. The Sweetwater® regenerative blowers can reach higher pressures and surpass the efficiency and functionality of most commercial air blowers even in the most corrosive of atm..
Whitewater® blowers are a very good value for aquariums, hydroponic and compost applications, pet stores, bait systems and seafood holding systems. They are smaller, lighter and quieter than most blowers and very energy-efficient. They feature a "cupped" impeller for reduced noise. The speci..
Air manifolds allow you to split your airflow in to multiple diffusers in the pond, lake or tank. Constructed of heavy duty steel and brass, each outlet is equipped with a pressure relief valve as well as a pressure gauge. Includes a 18" length of heater hose and a steel barbed hose adaptor to fi..